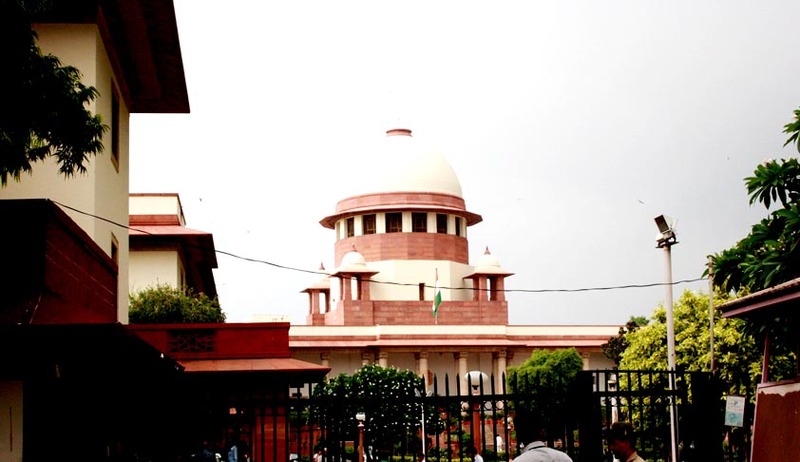 The Supreme Court of India in a recent judgment has commuted the death sentence of Amar Singh Yadav , convicted for the death of his wife and two children to life in jail. The Division bench said that death sentence awarded by the High Court of Judicature at Allahabad is not warranted in this particular case and commuted the death sentence to life imprisonment. Amar Singh Yadav, a Police Constable of the Uttar Pradesh Police was convicted for the brutal murder of his wife and children. Amar Singh had developed illicit relationship with two other women and this caused the family to get half of his salary to sustain them. This angered Amar Singh and with the intention to kill them took his family in a car with the pretext of doing shopping for the marriage of one of the daughters. He then with the help of his friend sprinkled petrol all around the van after locking the doors and set fire burning all occupants of the Maruti van to death and pushed the burning car into a pit with an intention to not let them escape. But in the meanwhile a Police Inspector was patrolling the area reached the spot and pulled them out. The wife and two children except one died at the hospital. They gave dying declarations and an FIR was filed. The Sessions Court of Kanpur found Amar Singh guilty for the offences under Section 302, 307 and 436 IPC. The accused was convicted and sentenced to rigorous imprisonment for life on count of Section 307IPC. He was further convicted and sentenced to rigorous imprisonment for seven years on count of Section 436 IPC. The accused was further convicted and sentenced to death and Rs.10,000/- fine on count of Section 302 IPC and it was directed that he shall be hanged by the neck till death. The High Court upheld the conviction and death sentence of Amar Singh. The bench consisting of Justice Sudhansu Jyoti Mukhopadyay and Justice Dipak Mishra while commuting the death sentence incident held that this “does not fall within the category of “rarest of the rare case”, and, therefore, death penalty was uncalled for. “This is not a fit case to impose a death penalty.” The Court further said, “But there is no room but to suggest that the accused caused the death of the deceased”. The dying declarations clearly implicate the accused. Though we are convinced that the prosecution has proved the guilt of the accused beyond all reasonable doubt, the accused committed the crime in a most cruel and inhuman manner. The helpless wife and young children, though who fell victims to the avaricious conduct and lust of the appellant, the Court held that the case does not fall within the four corners of the principle of “the rarest of the rare case”, though no leniency can be shown to the appellant.”. The Court while relying upon Ronny alias Ronald James Alwaris and others vs. State of Maharashtra, 1998 (3) SCC 625, found that nature of the crime and circumstances of the offender do not reveal that he is a menace to the society and the death sentence should be reserved for exceptional cases only. The Court found that though the killings were brutal, these did not fall under the rarest of rare category. While commuting the death sentence the Supreme Court also ordered Amar Singh to serve a minimum 30 years in jail before considerations for premature release after significantly relying on earlier precedents set up the Supreme Court itself in cases of Sandeep vs. State of Uttar Pradesh, (2012) 6 SCC 107 and of Haresh Mohandas Rajput vs. State Of Maharashtra, 2011 (12) SCC 56.